Kienböck’s disease is a rare condition that may lead to chronic pain and wrist dysfunction. 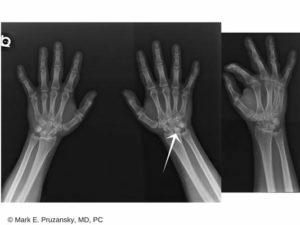 This condition is a result of poor blood supply to one of the eight carpal bones in the wrist and subsequently become damaged. It may also be called avascular necrosis of the lunate or osteonecrosis of the lunate. Kienböck’s disease typically presents in men aged 20-40 who participates in recreational activities that repetitively load the wrist. Patients typically present with reports of activity-related dorsal wrist pain, poor grip strength, and decreased wrist motion. Painful and sometimes swollen wrist. Limited range of motion in the affected wrist. Decreased grip strength in the hand. Tenderness in middle of the wrist. Pain or difficulty in turning the hand upward. There may be an association between negative ulnar variance and Kienböck disease. Pathological changes are equivalent to osteonecrosis of other bones. Disruption of critical blood supply results in bone infarction and central necrosis in addition to surrounding hyperemia. This disease may result in deformity to the bone surface. The pathologic changes are equivalent to those of osteonecrosis of other bones. There is disruption of critical blood supply leading to bone infarction, central necrosis, and surrounding hyperemia. Microfractures may also ensue, resulting in further flattening and deformity of the bone surface. Being seen by a specialized doctor is the first step to getting a diagnosis for Kienböck’s Disease. 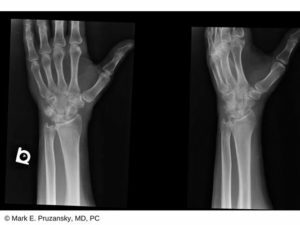 It is important for you to schedule your appointment with HandSport Surgery Institute so that Dr. Mark Pruzansky and Dr. Jason Pruzansky can examine your wrist, they may recommend plain films form the basis for staging and treatment of Kienböck disease. Additionally, tomograms may be useful in determining the true extent of disease though computed tomography (CT) scan would be the best imaging modality for evaluating the lunate. The primary methods of nonoperative treatment are immobilization and anti-inflammatory medications. Treatment may be directed by the level of symptoms. Ice: Cool the area with a cool pack or ice bag to reduce swelling and pain. Patients with moderate-to-severe symptoms are candidates for surgical intervention. Additional factors to consider are the patient’s activity level, personal goals, and the surgeon’s experience with the procedures. Surgical options may include revascularization to improve blood flow to the bone by removing a portion of bone with attached blood vessels from another bone, joint leveling to bring both lower arm bones to the same length, a proximal row carpectomy to remove a collapsed lunate, or fusion to ease pressure on the lunate by fusing nearby wrist bones together. Please contact us as soon as possible to schedule an appointment with our talented team. People experiencing Kienböck’s disease should be evaluated to try and reduce the risk of further injury and mobility issues.